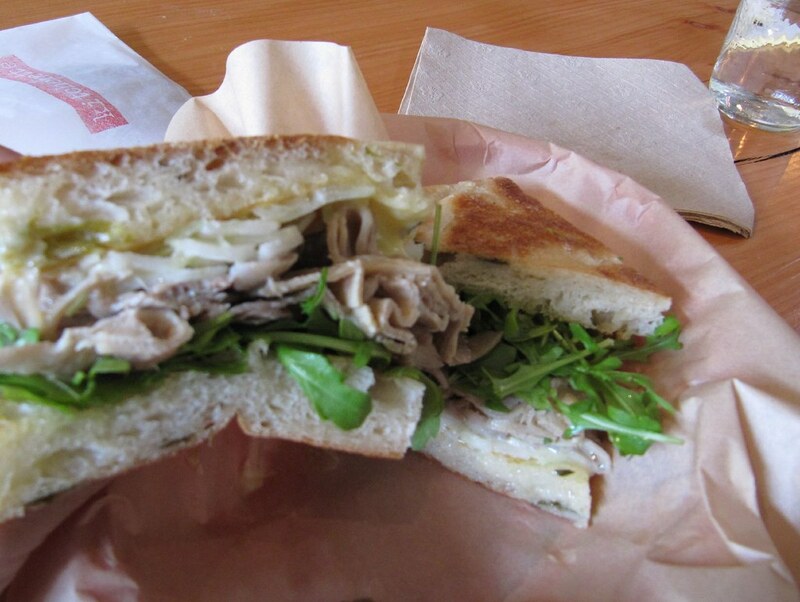 The porchetta is my new favorite at kitchenette, just slightly edging out the fried chicken sandwich. Thinly sliced porchetta on a toasty green onion foccacia-ish bread. Every bite drips with rosemary and sage scented jus balanced by freshness from crunchy shaved fennel and peppery arugula. The space at Heart is comfortable and I like the option of being able to sit down inside when it's sixty degrees outside. I'll have to come back and see what other food they can do without a kitchen. I've gotten into the habit of going straight to the Tonayense trucks and having tripe tacos on a fairly consistent basis. Today, I decided to mix it up by trying out Taqueria San Francisco which is only a hop, jump and skip away at 24th and York. TSF is in a clean, well lit corner spot with plenty of seating and Telemundo playing on one tv screen. Good, I can practice my Spanish while I munch on the some chips. Unfortunately the chips were the generic type found at the majority of taq's around town. They were saved by two varieties of salsa, one an innocent looking pico de gallo that revealed its inner spiciness after I ate a huge spoonful. 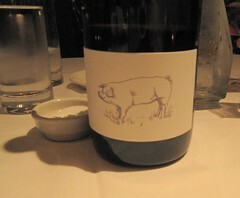 It was fresh and piquant while the other liquidy red pepper tomato looking number, tasted bright and vinegary. Both were good counterpoints to the heaviness of cheese and pork that was to come. I ordered a Super Quesadilla Al Pastor, despite the fact that Burrito Eater gave it a lower mustache rating than the Carne Asada. You might wonder, what kind of Mexican food afficionado orders a quesadilla? 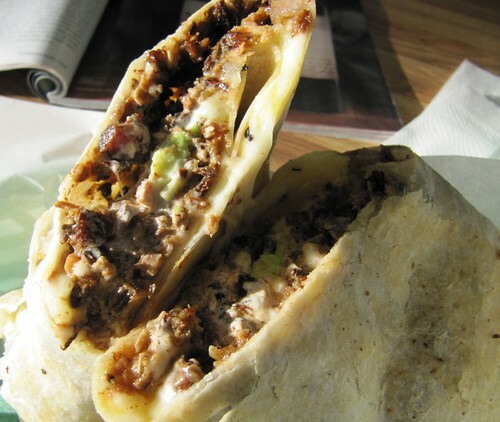 Well, it's just a burrito minus the beans and rice. Cutting these corners are critical part of my strategy to avoid the need for a post lunch siesta and therefore a sign of prowess (think of everything I accomplish while you burrito eaters are sleeping). The al pastor was juicy and tender with the right amount of smokiness and char without any of the dried out burnt bits that you sometimes get at other places. It wasn't coming right off of a Mexico City style rotisserie, but it was on par with the al pastor at the trucks. The cooks took a lot of care in making the quesadilla and I appreciated that the tortilla was fresh and nicely toasted. I'll come back to try some of the other things on the menu. With Lunar New Year, Mardi Gras and Valentine's Day falling on the same weekend what else was there to do but have a three day festival of food and nature in Yosemite. The first day we celebrated Tet and Chinese New Year, the second Mardi Gras, and on the third day we celebrated Valentine's Day with a snowball fight. Tet was kicked off by Bang Chung a traditional Vietnamese dish of mung bean paste wrapped in glutinous rice wrapped in banana leaves and boiled for a long while, then toasted in a pan. HM made them from scratch using a family recipe. When it was described to me, I thought it was going to be a starch bomb, in fact it was a beautiful study in textures. Toasted exterior crunch with a sticky and somewhat chewy glutinous rice interior and then a soft earthy bean paste. Nothing like what I imagined. 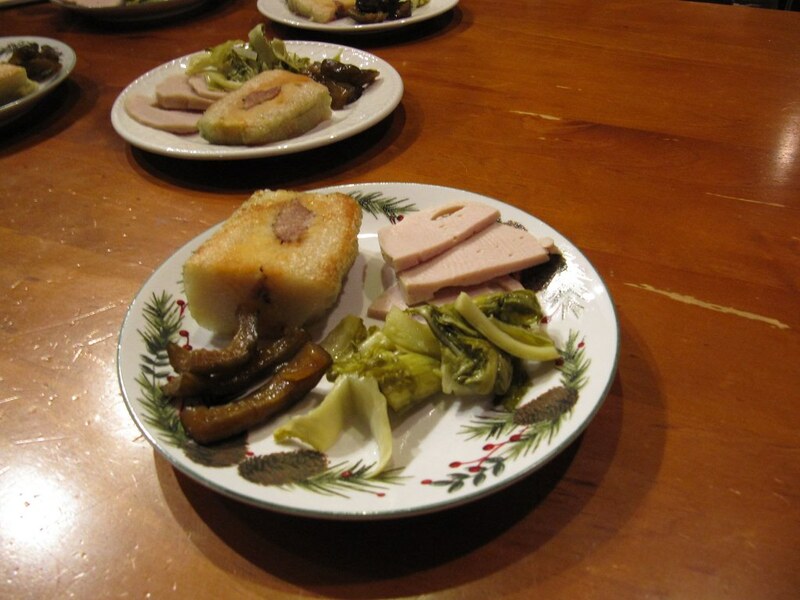 HM pickled some vegetables to go with it and accompanied the whole thing with a side of steamed pork ("fancy pork"). Next came a dumpling course, which was originally sway jiao ("water dumplings"), but we decided to challenge ourselves to make xiao long bao (XLB). C dutifully made the soup aspic the day before then prepared the filling that evening. All of us then got to work in our little dumpling sweatshop making the xlb and placing them in steamers. It was fun playing around with the amount of soup that would be in each dumpling. We went for some super soupy ones. They looked great. 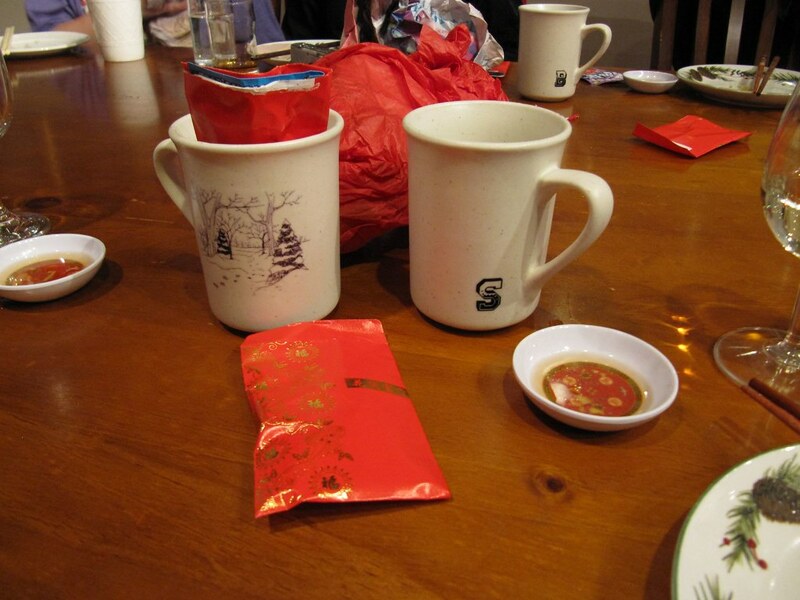 After some complications with steaming them, including scorching my lip with some soup from a sample dumpling, we realized that the wrappers were the source of the difficulty. Next time we'll need to adjust the wrappers, but the flavor was good and the dumplings were full of soup! We also had a seafood noodle interlude, a recipe from R's mother. A good balance of seafood flavor and fresh noodles. Nothing beats the special dinners at Oliveto. Even with my high expectations, I have never had a disappointing meal at this restaurant and I'm in good company. Antipasto of pork tongue, artichokes, and black truffles - tender pork tongue and quartered artichokes in a earthy cream sauce. Canederli: Friulian bread and pork dumplings with pork and date sugo - definitely one of the standouts of the night. Soft meatball-like dumplings on a slightly sweet date sauce that complimented the pork perfectly. Spaghetti with pork coppa confit, Calabrian hot peppers, breadcrumbs, and oregano - a favorite from last year, and another favorite at our table again. Beautifully textured and cooked spaghetti dotted with chunks of pork coppa, in a porky, spicy sauce with nice crunch from the breadcrumbs. Pappardelle nere with pork heart and wild mushroom ragu - You just can't go wrong with the pasta here, perfect texture and seasoning. The wild mushroom ragu was so deeply flavored with wild mushrooms it tasted like they had distilled an entire forest of mushrooms into the sauce -- it worked with the strong flavors of the pork heart. We were looking for a place with good food and a decent martini, so we found ourselves at Nopa. I've always known this place to be very busy, but optimism trumped experience and we showed up with no reservation on a Friday night. Good thing we wanted to start with drinks, so spending time at the bar waiting for a table was no problem. We enjoyed our drinks and company so much that two hours flew by before we were seated. The staff checked on us regularly to let us know we were moving up the list and were gracious enough to comp us some olives for our patience. It's not the complimentary food that impressed me, but how professional and gracious the hostesses were and how well the bar tenders and servers took care of us. The flatbread is a must-get starter at Nopa. This time it was topped with sausage and taleggio cheese, a good balance of salty full flavored cheese, sausage and nicely crisped flatbread. My favorites were the fried brussel sprouts with pieces of fried meyer lemon; and another starter of sardines accompanied by grilled bread and hummus. I would definitely order both of these again. I also tried the braised short rib which was tender, delicious and a huge portion, though my friend declared that it was not as flavorful as the one I cooked for a dinner party. Full disclosure -- she had consumed several cocktails by that time. We all felt the short rib was good, but could've used some type of counter point to freshen it up after the long braise. Still, it's something she'd order again. Our other companion had the baked pasta dish which he had claimed was his favorite based on previous visits. This time he thought it was a bit oversalted. Probably just a mistake in the kitchen on a very busy night. All in all, the food was as good as I remembered it. Solid, delicious, high quality, generally well executed (notwithstanding the pasta), nothing earth shatteringly creative, but food we'd happily eat. A place that we'd happily return to spend an evening eating, drinking, enjoying good atmosphere and excellent service.